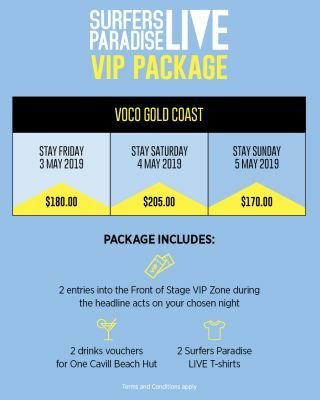 Surfers Paradise LIVE is an award winning four-day free music festival held on Surfers Paradise beachfront. This year the festival is presented by voco™ Gold Coast and will be an exhilarating live music experience. Enjoy all your favourite Aussie artists and make a weekend of it with our VIP Packages. Get in quick as there are only a limited number of VIP Packages available!